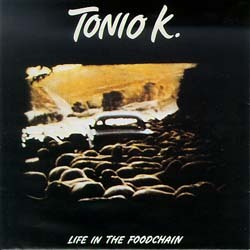 Tonio K. "Life in the Foodchain"
When this album was first released in 1979 (on Epic Records) it garnered incredible press (Stereo Review called it "the greatest album ever recorded!") and established Tonio K.'s reputation as one of the most thoughtful and outrageous songwriters in the country. Subsequent albums solidified his legacy, and Tonio K. is currently regarded as one of the premier songwriters in the country (having penned hits for Bonnie Ratt and Vanessa Williams, among others). "Life in the Foodchain" laid the groundwork.